When Mo found this fiddle she must have been near the top of her form as a treasure hunter! Joseph Ruddiman was a stubborn individualist of a Scotsman, working in Aberdeen from his fourteenth year according to Professor Henley. 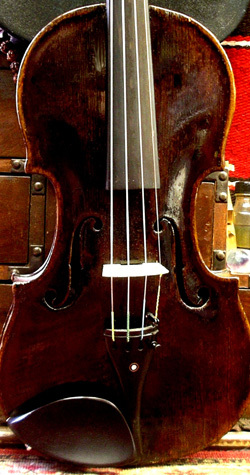 Ruddiman had abandoned his Stainer model by the time this fiddle was made in 1780 and had adopted something akin to a large Strad outline and arching. 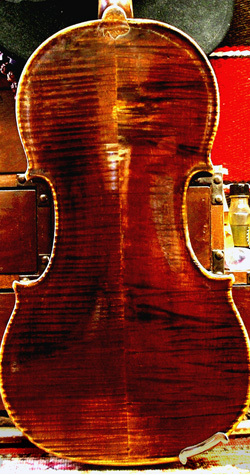 This fiddle is unpurfled, a characteristic touch, and is covered in a dark brown varnish. An intriguingly slender pegbox completes this assemblage of oddities. This fiddle would sell for $4500 in today’s market if it had more of a classical sound. Mo tuned it to the “dead man’s tuning” (ddad) and found it was perfect for those droning Appalachian airs! It’s also found favor with Irish fiddlers. One can hold a little piece of history in one’s hand when one takes up this fiddle. The ornate original label is another treat.